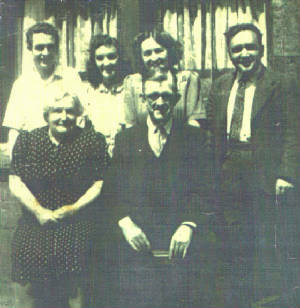 Mary & Jack Loftus with four of their five surviving children. My mother's family came from Galway originally. My earliest known ancestor was James Loftus who married Catherine Egan on the 31st of January 1820. They had at least three children that I know of.Their eldest child Patrick Thomas was born one year later. They lived in a place called Tynagh near Portumna. The parish of Tynagh lies in a flat land area between the rivers of Kilcrow and Cappagh. There are some picturesque views of the Slieve Bloom Mountains and the river Shannon. The Cappagh river and its tributary the Duniry river, were the source of power for some mills that operated in the district. These mills processed corn and wool. Loftus was an uncommon name for the area and it is possible that the family changed their name from the Irish O'Loughlin to Loftus during penal times. My grandfather also claimed that the family had changed their name from O'Loughlin to Loftus at some point in their past. Patrick Thomas was a carpenter and married Mary Reede from Borrisokane, Tipperary in 1852. Apart from his birth and marriage I know very little about him. However he passed his carpentry skills on to his son James Loftus. His wife Mary I know even less about, however there is both a John and Jane Reede mentioned in the Griffiths Primary Valuation of 1852 for Borrisokane. James was my great grandfather and he was one of the last pole lathe woodturners in Ireland. James was the second child of Patrick Thomas and Mary. He was born in Portumna on the 19th of March 1855. He had an older brother Thomas, a younger brother Patrick and a younger sister Catherine. As a young child Catherine was sent to live with relatives of her mother Mary Reede in Boston Massachusetts, U.S.A. She was never heard from again and no one knows what happened to her, if she indeed ever reached Boston. It is unclear why she was sent to America. Her mother died in 1866 when she was only nine years old. It may have been the case that her father found it difficult to cope on his own with four young children. There are large gaps in the Loftus family history. Questions that cannot be answered such as, how they may have coped during famine times? The fact that they were craftsmen rather than farmers may have been the key to their survival during that terrible period in Irelands history. Patrick Thomas Loftus died before 1877 and his son James married Mary Grady in Killeen church on the 31st of October 1877. Killeen is a townland in the parish of Tynagh. Mary was the eldest daughter of a miller called Henry Grady and his wife Bridget Cunningham. For the first three years of their marriage James and Mary remained in Tynagh and their first two children Patrick and Martin were born there. By 1881 James and Mary had left County Galway and moved to Borrisokane, Tipperary which was the home town of James's mother. They lived in the townland of Galross and Borrisokane was to remain their home for most of their married life. The Irish name for Borrisokane is Buiriod Ui Chein, Cian was the founder of the O'Carroll clan. The O'Carrolls ruled this territory before and after the Norman occupaton. This photo was taken by my grandfather's younger brother Bill Loftus a World War One veteran and keen amateur photographer who developed and printed his own work. James and Mary had eleven children including my grandfather Jack (pictured in the top photograph with my grandmother Mary). Three of James and Mary's sons went off to fight in the First World War. Their youngestJosephwas killed in battle in France in 1917. Martin died five years later from the effects of gas poisoning during the war. James Loftus learned the craft of wood turning from his father. The trade was a difficult one to learn and very laborious. He made his own pole lathe, it was primitive, almost medieval in appearance. In fact pole lathes similar to his were in use as far back as the thirteenth century. The craft of wood turning was most probably developed in ancient Egypt. Wood turning in Ireland was practised as far back as prehistoric times. The variety of work that could be done on the pole lathe was immense and this was purely because of it's primitive and peculiar design. The complexity and intricacy of the work produced by James could not be achieved on a modern lathe. The tools he used were made in the local forge in Borrisokane and James himself tempered and ground them. James mainly manufactured dairy utensils, small churns and butter prints on which he hand carved his own designs. However he also made wooden pails, dishes, flower and shrub planters, centre pieces exquisitely carved for the ceilings of country houses and elegant furniture with turned legs. This is a photo of the lathe in action. The operator is Jim's son Tom Loftus. One of his grand-daughters remembered a frieze he made for a shop in Borrisokane. It consisted of an Irish wolf hound lying in a field of shamrock. This beautiful piece was fashioned from native hardwood. Another grand-daughter, my aunt, has in her possession a beautifully carved flute also made by him on his lathe. His business thrived and his products were sold at home and abroad. His wares found ready markets all over the midlands, the south and west of Ireland. He sold his products at fairs throughout Tipperary. During the Great War he did a great deal of trade with wholesalers in Dublin, Cork and Limerick, because of the shortage of metal which was needed for the war effort. It was not unusual for him to send a selection of sixty or seventy dozen articles to any one of these firms at a time. As with other wood turners James Loftus preferred to work with sycamore but sometimes used horse chestnut which gave a fresh clean finish. The supply of wood was used to the upmost efficiency. In the case of making dishes or bowls the sycamore tree was cut down by a felling axe, it was cut into lengths according to the diameter of the dish to be turned. If, for example, the diameter was 45cm, then the length of the tree cut would be 45cms and so on. These cut lengths would then be split in two and the heart removed and the outside of the dish would be roughly formed with a adze or a chipping axe. this rough shape would then be put on the lathe and turned. The back would be turned first and then the inside. Gradually and with great skill in using his tools, James would shape the inside of the dish leaving a core the shape of the dish but smaller in diameter, attached to the inside. The rough dish shape was taken from the lathe and the solid core removed by driving a wooden curved wedge between it and the dish with a wooden mallet. This core would be removed neatly and returned to the lathe where the same process would be repeated. From one block of wood James could make four or five dishes of decreasing sizes with very little wastage. James practised this ancient craft for more than sixty years, up until his death in 1933. In later years the introduction of mass produced items from Japan and the far east began to hit the wood turning industry dramatically and the ancient craft has all but died out. In 1935 two years after his death representatives of the National Museum of Ireland visted his small factory in Borrisokane and with the consent of his family they took the lathe to the museum in Kildare St, Dublin. The family also donated his tools and a selection of small items manufactured on the lathe. The lathe and these items remain in the possession of the National Museum. A replica of the lathe is currently on display at the Museum of Country Life, Turough House, Castlebar, County Mayo. Jack was the fourth child of James and Mary Loftus. He was born in 1884 and in 1911 he married my grandmother Mary Mackey in St Brendans Church, Birr, County Offaly. A life long love affair and marriage that lasted 58 years until his death in 1969. Mary was born in a place called Derrymore a few miles outside Tralee in County Kerry on the 20th of May 1890. At the time of her birth her father Patrick Mackey (a railway gauger) was working on the construction of the Tralee to Dingle line which was in full operation up until the 1950's. Her mother was Mary Rourke the daughter of Patrick Rourke and Bridget McCormack farmers in Shannonharbour, County Offaly. Mary's father died when she was very young and at the age of five she and her sister Bridget were placed in the Convent of Mercy orphanage in Birr. She also had two older brothers Peter and Martin. Both boys lived with their maternal grandparents and Peter was a member of the County Offaly Gaelic Football team. Martin became a soldier. Mary and Bridget remained in the orphanage until they were sixteen spending occasional holidays with their grandparents. Both girls went into domestic service. Bridget married very young and emigrated to the U.S.A. with her husband Tom Rierdon around 1916. Mary went to work for the Sisters of Mercy at their convent in Borrisokane as a domestic servant. It was there she met my grandfather. The Convent of Mercy Borrisokane Co. Tipperary were my grandmother worked as a domestic servant from the age of sixteen until she married my grandfather. 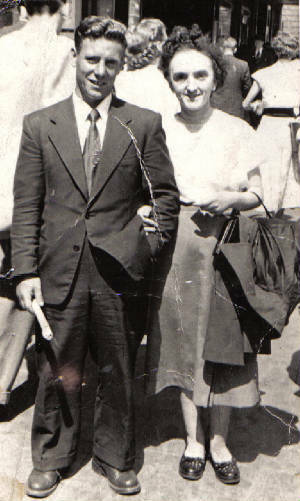 After their marriage my grandparents lived in Belfast for three years before moving to Glasgow. Their address in Belfast was Herbert St in Ardoyne which is an area to the north of the city. My grandmother worked in the linen mills there while my grandfather worked in the shipyards. Although Jack did not follow his father into the family business, he did inherit some of his fathers talents and he too was a very gifted artist. He was ambidextrious and could draw with both hands. As a small child I would watch him draw with great delight and then try to copy what he had drawn. As a carpenter he was more than capable and produced some very intricate pieces of work including a grotto for the local church. He could work with leather, cobble shoes, and mend bags. His greatest love though was his allotment where he grew cabbages carrots and potatoes which he sold to local shops and neighbours. His vegetables were all organically grown and very popular. In later years he turned his hand to gardening and in the summer months his garden was a blaze of colour. He had a great sense of humour and enjoyed a party. His favourite tipple was guinness (what else) and his party piece was "Paddy McGinty's Goat". Below is a picture of him with his son Harry at aHogmanayparty in Glasgow the year before he died. They are dressed as Flora McDonald and Bonnie Prince Charlie. With a little bit of imagination you can see the resemblance!!!! He died in July of 1969 and up until a few days before his death he was still working in his beloved garden. This is a brief history of my Loftus ancestors. I have an extensive database on this family. If you think you may have links with the Loftus Family of Galway Tipperary and Glasgow or you would like some help in tracing your Irish roots please do contact me. You can find my email address on my main page. Useful links, addresses, and books. The Genuki Galway page. Definitive guide to County Galway. The County Tipperary Historical Society Homepage. County Tipperary page, part of the IrelandGenWeb. A guide to travel and the history of Tipperary. Collins Barracks, Benburb Street, Dublin 7. The National Library holds, amongst other things, the catholic parish records for most of Ireland. The National Archives holds the 1901 and 1911 census records for the whole of Ireland. General Registrars office has a search room where for a fee you can search civil registration of births, marriages and deaths dating back to the beginning of civil registration in Ireland in 1863. Tipperary by Mairtin O' Corrbui. A portrait of the county. The Burning of Bridget Cleary by Angela Bourke. A true story set in rural Tipperary towards the end of the nineteenth century. Tracing your Irish Ancestors by John Grenham. The amateur genealogist's bible.